Show Me The Movies: Review - Coco - Visually stunning and entertaining tale that have become the norm for Pixar studios! Review - Coco - Visually stunning and entertaining tale that have become the norm for Pixar studios! Despite his family's generations-old ban on music, Miguel dreams of becoming an accomplished musician like his idol, Ernesto de la Cruz . Desperate to prove his talent and following a mysterious chain of events Miguel finds himself in the stunning and colorful Land of the Dead. Along the way, he meets charming trickster Hector and together, they set off on an extraordinary journey to unlock the real story behind Miguel's family history. A Disney/Pixar production with Lee Unrich (Toy Story 3) in the director's chair Coco was a film that showed promise from the outset. Combining a visually stunning canvas (the underworld is one of Pixars astounding spectacles to date) to a tale rich in folklore and custom along with can be tricky subject matter for a family film in themes life and death, was always going to be a difficult task but as we have come to expect from any Pixar production these days, they deliver emphatically with this latest offering showing the originality and imagination that are contained throughout so much of Pixar's back catalogue. 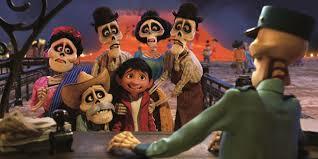 Firstly, the film looks amazing, with the colourful animation playing a starring role in the films core message. The narrative too, glides along at a comfortable pace with plenty of laughs along the way for all the family to enjoy. The strong moral and emotional message that entertains both young and old is prominent here also with more than a trace of Pixar's 2015 big hit Inside Out in the way that these delicate life lessons are delivered. Critical acclaim has already been achieved with this film recently winning the Golden Globe for Best Animation and don't be surprised if that's not the end of the silverware before the season ends. Following on from a year of family friendly box office success in Ireland, where family films made up 60% of the top 10 grossing box office, 2018 has begun quite strongly again with this latest fantastical offering hopefully the signs of things to come. Overall, Coco is a visually and emotionally rich and highly entertaining family friendly tale that will bring a smile to all both young and old. Highly recommended!